You can determine if you need to put an extra disclosure statement on your FDA-regulated label by reviewing the recommended levels per Reference Amounts Customarily Consumed (RACC) for these nutrients. You’ll need to add a disclosure statement if the nutrient in your product exceeds the RACC per labeled serving or, if your food product has a small RACC, per 50g. A small RACC is defined as either being under 30g or equal to or less than 2 tablespoons. Additionally, while the USDA does not require trans fat to be listed in the Nutrition Facts Panel, the FDA does. 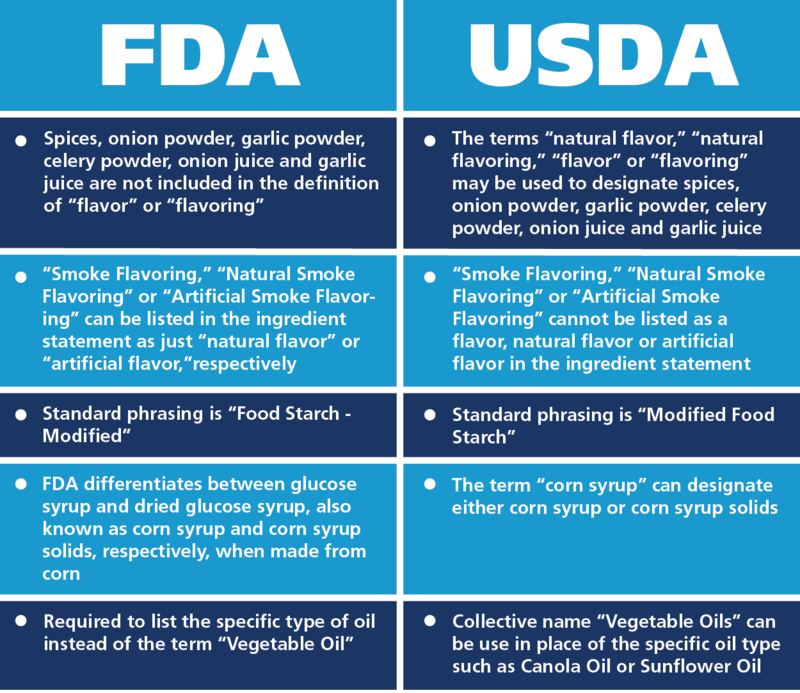 In general, the USDA’s nutrition claim requirements do not match the FDA’s exactly, so manufacturers should be sure to check the applicable regulations to ensure compliance. The USDA’s definition of “natural” takes into account whether the product and its ingredients are “not more than minimally processed.” The FDA does not have an exact definition of the term “natural.” However, it has considered the term “natural” to mean that nothing artificial or synthetic – including all color additives, regardless of source – has been included in or added to a food that would not normally be expected to be in that food. However, this policy was not intended to address food production methods, such as the use of pesticides, nor did it explicitly address food processing or manufacturing systems, such as thermal technologies, pasteurization or irradiation. the permitted use of the statements “and/or, may also contain or contains one or more” for minor ingredients (less than 2%). For specific requirement, refer to Policy Memo 072.
the allowance to list “sodium phosphates” or “potassium phosphates” as a collective name. the ability to interchange two meat ingredients without changing their order in the ingredient statement, as long as they comprise at least 70% of a product’s recipe and each ingredient makes up more than 30% of the product. On the label, the word “and” is used instead of comma – for example, “beef and pork.” This applies to meat and poultry, respectively, but not to a mixture of meat and poultry. 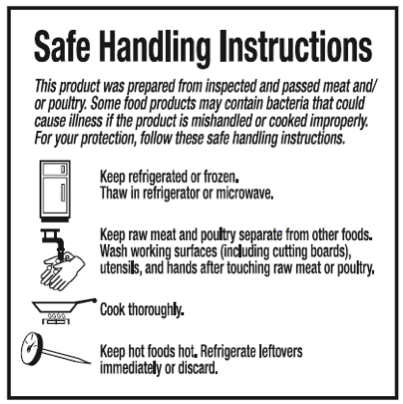 The USDA requires raw products or products that are not considered “ready-to-eat” (RTE) to have “Safe Handling Instructions.” The FDA does not have specific safe handling labeling instruction requirements. 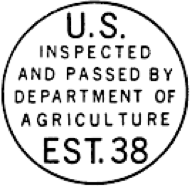 Unlike on an FDA-regulated product label, USDA products require manufacturers to list an inspection legend and establishment number. 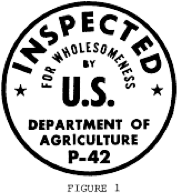 This inspection legend designates that the product was inspected by the USDA. The establishment number may or may not be listed as part of inspection legend, but must appear somewhere on the label. 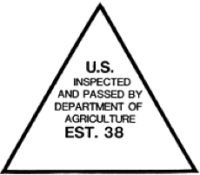 Exporters of USDA products may or may not have their own inspection legend, but will have an establishment number. The USDA requires imported products to have a “Product of…” statement immediately under the name or descriptive designation of the item on the PDP. The FDA does not have specific requirements on the location of the Country of Origin (COO) statement, but it is usually added after the domicile. Customs and Border Protection (CBP) [19CFR134.46] requires the COO to be listed in close proximity to the domicile if the company address listed as “manufactured for,” “distributed by,” etc. is US-based. Do you know if your product falls under USDA or FDA regulations? Mérieux NutriSciences’ Labeling Compliance & Nutrition Services team can help determine which labeling regulations apply to your product and ensure you’re in compliance. Mislabeled products can result in a recall, damage to your brand’s reputation and risks to consumers’ health. Take a proactive step to prevent mislabeling by conducting a food label review. Download our information sheet to get started today! Ralph Meer is a Regulatory Compliance Specialist in Food Labeling at Mérieux NutriSciences. Prior to Mérieux NutriSciences, he spent several years working as a labeling specialist for a leading food service distributor reviewing labels for compliance. He also worked as a labeling consultant for many years working with many notable companies. Ralph’s expertise is in US FDA and USDA Food Labeling and Nutrition. 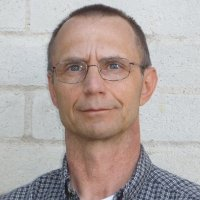 Ralph has a BS from Penn State and holds a Masters Degree in Nutrition from Oregon State and is a registered dietitian. In his downtime, Ralph enjoys watching his favorite Pittsburgh sports teams.